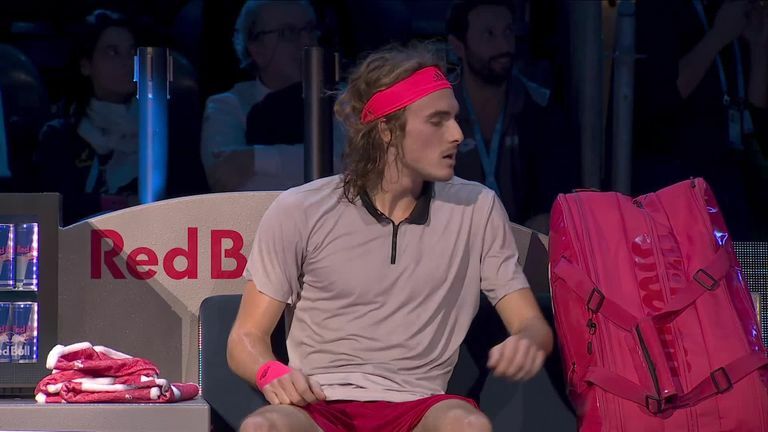 Stefanos Tsitsipas steadied himself after flying into a fourth-set rage to see off Andrey Rublev and set up a showdown with Alex de Minaur at the Next Gen ATP Finals. The Greek youngster lost complete control in the fourth set of the innovative event in Milan, flying into a rage when returning to his seat. He then angrily demolished his headsets which enables him to communicate with his coach, suffering a freak hand injury in the process, before then receiving medical treatment. Tsitsipas subsequently lost the set, but quickly steadied himself to win the match 4-3 (7-3) 3-4 (5-7) 4-0 2-4 4-3 (7-2) after two hours and nine minutes. "It was a rollercoaster match and I got very frustrated with all the breaks of serve I suffered," said Tsitsipas, who finished runner-up to Rafael Nadal in Barcelona and Toronto this season. The top seed, who picked up the ATP Most Improved Player Of The Year Award on the night, ended the hopes of the 2017 runner-up to set up a meeting with De Minaur, who was made to sweat against Spaniard Jaume Munar. Australia's De Minaur, who lost just one set throughout round-robin play, also came through in five sets, winning 3-4 (5-7) 4-1 4-1 3-4 (4-7) 4-2. De Minaur, 19, began the season at No 208 in the world rankings and reached a career-high 31 last month. It will be the pair's second meeting this month after Tsitsipas beat De Minaur at the Japan Open Tennis Championships in three sets. QUIZ: Know your ATP Finals?